$125 Spring Special! Valid 04/10-04/18! Kaleialoha #308 Oceanfront Remodeled! $125 Spring Special! Valid 04/10-04/18 & 04/26-04/30! Come stay in our beautiful condo home. Our unit features granite countertops, stainless steel appliances, new cabinets, kitchen supplies, recessed lighting, and tile flooring throughout. All new living room furniture including a flat screen TV/DVD/CD player. Our bathroom also features a granite countertop and a remodeled bathroom shower and fixtures..it came out beautiful! We have our own washer/dryer in the unit for added convenience. Our bedroom we now feature a king size bed and we've put in a small TV in the bedroom also. We've also added a brand new queen sleep sofa in the living room to accommodate up to 4 people comfortably. We've taken great care to make sure our home has all the amenities that we like to have ourselves when travelling. Our bed is super comfortable and all the new furnishings were selected for comfort and convenience. 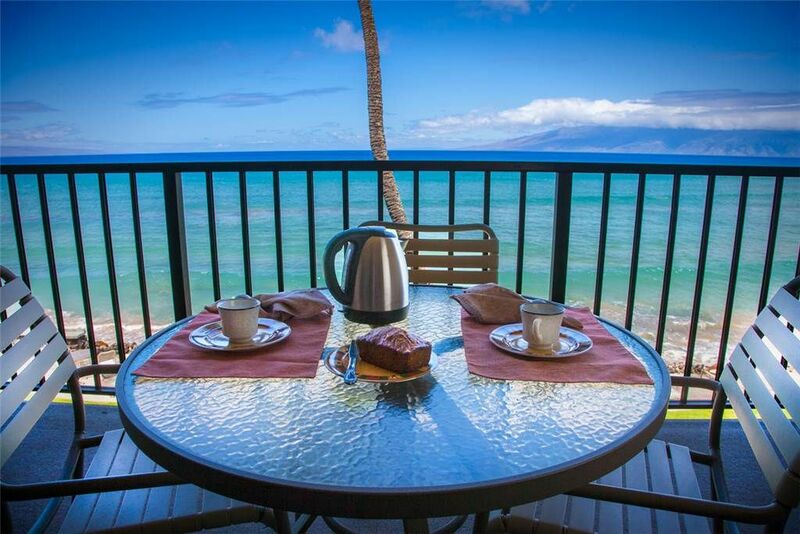 Kaleialoha is located in Honokowai just north of Kaanapali and directly OCEANFRONT! We have a magnificent view of both neighbor islands of Molokai and Lanai and simply the most perfect spot for watching our incredible sunsets and whale watching! Only four stories high our property is relatively quiet set away from all the high rise resorts and condominiums. We enjoy the convenience of being within walking distance to the Honokowai Shopping Center, the Kahana Gateway Shopping Plaza, and especially the Farmers Market..we love the Farmers Market it's so much fun! Not to mention the park and beach are directly across the street from the Farmers Market and it's absolutely lovely with a playground for the kids, picnic tables and grills...it's great! Take advantage of our home grocery delivery service. It's wonderful especially for the first night that you arrive. When making your reservation just let us know what you would like to have stocked for your arrival. Save yourself that extra stop on the way in from the airport. Be sure to enjoy all the wonderful restaurants in our area. Roy's is just up the street and considered one of Maui's best! For golf Kapalua Resort is only 10 min north of us the Kaanapali Golf Resort is only 5 minutes south of us. You'll find easy access to all the beaches all along the lower road where we are. Or call our management staff on island and they'll provide you with maps and info on the island that we're sure you'll find helpful. We may not be on island, but our management team is. They are on call 24/7 so don't hesitate to call upon them when you arrive. A large window AC in the living room -runs very cold! We had a lovely time and would stay again! Everything was generally as described in the listing. 3. Recently upgraded and generally well maintained unit. Kitchen unit was nice! Good sized unit for a family of 4 - 2 adults and 2 kids under 11. 1. A/C unit is old and noisy and definitely needs replacement. It also wasn't able to cool the room and turned out that opening the door to the balcony worked better as it was cooler and breezier outside. 2. Some of the materials from (we assume) recent renovation were still in the closets, not sure why - paint cans, construction tools etc. 3. A few items can be replaced and show their age. They work fine, just look old and bring down the modern-ness of the apartment - the pull out bed (couch), some of the chairs etc. Right on the beach. What more can you say? Unit was clean and well kept. Only exception is the AC unit which needs replacing. Will return. Thanks team Keialoha. Thanks for leaving a review, Robert. We always appreciate the feedback. We will be sure to look at that A/C unit. We're glad it's not going to prevent you from returning again. Thanks for being our guest! We just came back from Maui. The first day of our arrival I stayed in apartment and clean.It was dirty and full of ants. There is a kitchen,but obviously we could not have any meal because hundreds of ants are created in seconds. Manager says this is normal and their number depends on the waves and time. I could not believe what the woman was talking about!!! Towels were later brought because in the bathroom was only one towel for three of us and they brought dirty towels! The website says it has air conditioning in the apartment, it's partly true, because the air condition only has in the living room, in the bedroom is terribly hot and humidity. Our experience is terrible and not worth even half the price how much did it cost. I wish that I could put less than one star. In my phone I have the proof of all that I said in this text, but I do not see the option where I could attach the pictures. The only thing that worth in the apartment it's a view. Prior to booking, first ask if the apartment has been renovated and Is there ants!!!!!!! We will never return to this property again! Thank you for your feedback, Branko. We're very sorry you had such a poor stay. I had called your husband to inquire on the bad details of your stay, but he's wasn't to give as thorough an explanation of your dissatisfaction as you provided here. Please do understand, we are always paying attention to where we can improve. First, sorry about the lack of towels, and then the dirty ones that arrived after we were notified. This is not our normal standard, we will work to make sure it doesn't happen again. In regards to the ants, the property and around the unit are regularly treated by pest control, and as previous reviews can attest, ants don't tend to be an issue. With that said, we are on a tropical island, and oftentimes guests leave food out which attracts ants, and their numbers can vary by season, heat, and conditions. In regards to the A/C, we explicitly state in our listing, that it is a single window A/C unit. There are also two ceiling fans in the unit which tend to keep guests cool and comfortable. You did however, come in the heart of the summer and during our hottest time of year. Again, we are very sorry you had such a poor stay. Thank you for being our guest, and letting us know of the issues you encountered. Mahalo. The building itself is old but well maintained. The building and grounds are well maintained. The location was absolutely wonderful. Watching whales and occasional turtle from lanai. Our condo was old looking & could be updated. The housecleaning was not the greatest. I had to wipe down cupboards & walls below cabinets. Dust bunnies were flying off fans in living room and bedroom. Thank you for your kind review, Mary Anne. We always pay attention to what we're getting right and what we're getting wrong. We contract out with the best cleaning service in town, but it sounds like they may have missed a few things on your stay. We will be sure to let them know, and make sure the cleaning issues you raised are resolved. Thanks for being our guest. We hope you do consider a return in the future. Mahalo! Nothing makes us happier than having repeat guests stay with us again. Glad you liked the upgrades. Thanks for staying with us. Hope to you see you again soon! liked the view - saw turtles but no whales. Awesome view for sunsets. beach access closed as mentioned in the description due to a sink hole just outside the unit. There is a lawn and you'll notice a huge patch of dirt--it's because the dirt was put in it to cover the sink hole. However, there are reclining beach chairs on the lawn if you wish to enjoy the oceanfront view. Thank you for your review, Andrea. We appreciate you letting us know where we're getting things right and where we might be getting them wrong. We strive to always improve. The work on the beach sinkhole should be completed soon. Also, we're having our maintenance take a look at both the A/C and dryer vent, and get those issues resolved. We're sorry you had to deal with the neighbor's notes, but it does sound like ,with the exception of some minor issues, you had a good overall stay. It was our pleasure having you as a guest. We hope you do consider returning in the future.